Less emphasis on the previous three years of data particularly where a school has become and academy – the distinction between a converter and sponsored academy seems to have been removed. A number of changes to judgements around achievement in Early Years Foundation Stage & Key Stage 1 and Sixth Form which need to be checked using the Subsidiary Guidance in particular. 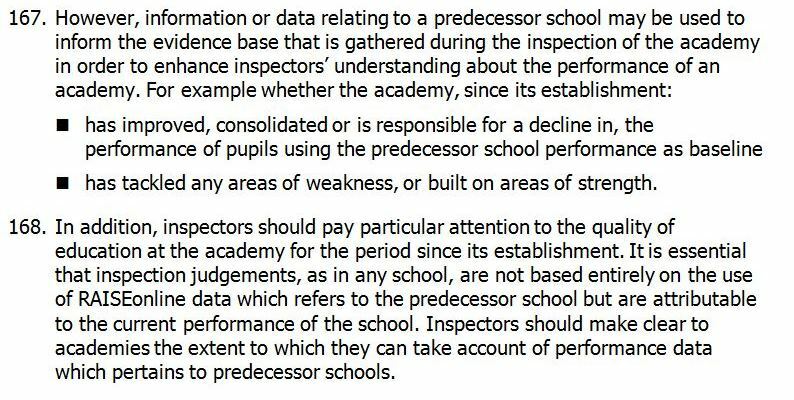 I have no special insight beyond that gleaned from reading the School Inspection Handbook and Subsidiary Guidance. This is not by way of a disclaimer, although maybe it should be, but it is also to invite others to add comments and suggestions to this work and help improve it for others. This on-going process of self-evaluation is seen as key by Ofsted but I would also suggest is key for the health of a school. If you are “number adverse” you may want to look away now. The Ofsted Inspection process is data driven and inspectors are used to interrogating a school’s achievement data and pursuing certain lines of enquiry revealed by the information. 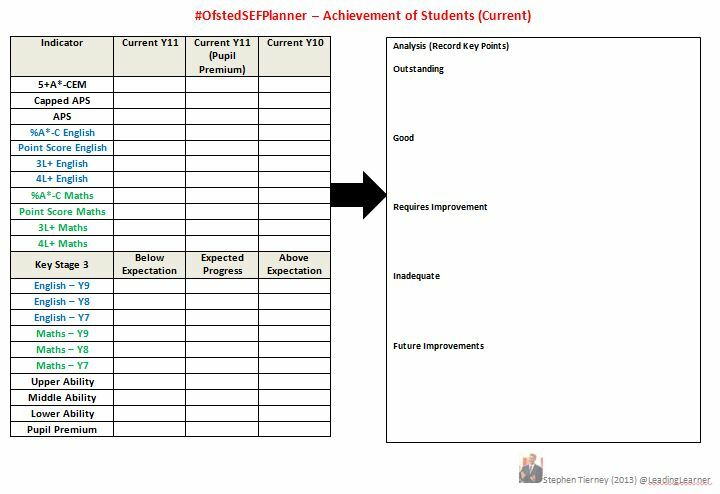 The challenge in producing this first section of the Self-Evaluation Form is to take a very large amount of information and tell the story about the successes of your students and school whilst still having an analytical perspective on the improvements that need to be made. I’ve always thought that this is the section that drives the whole inspection process – everything else is subservient to the achievement of students and judgements flow from it. This doesn’t mean I’m right, it’s just what I think. The current inspection requirement to look at the quality of teaching over time, as shown by results, has only reinforced this perspective. Progress and attainment are now looked at over time. The data below can be taken from the school’s RAISE document with unvalidated data from the school’s own Management Information System. It will hopefully provide a useful summary page to allow trends, positive achievements and potential areas that need addressing to be identified. Key attainment measures currently used are 5+A*-CEM, which may need to be considered alongside floor standards for some schools, percentage A*-C in English & Maths and point scores – total, capped and for English & Maths. Over recent years the English & Maths results have been pretty static at a national level but hugely variable within some schools. You may need to prepare a narrative on this for inspectors for your own school. 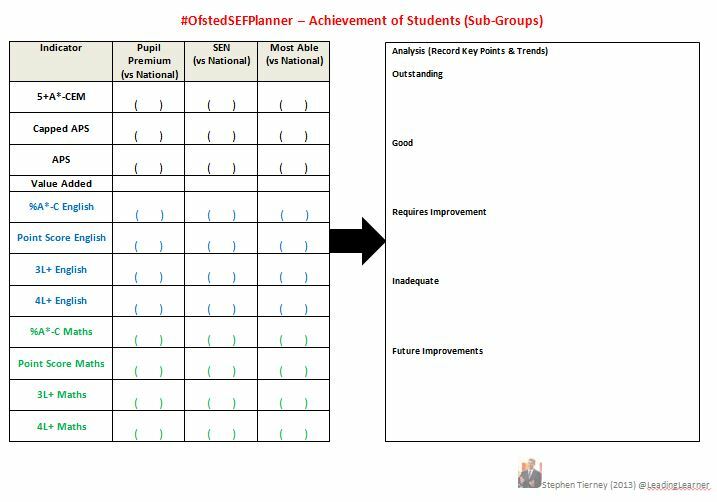 The progress measures of three plus levels progress, expected progress Key Stage 2 to 4, or four plus levels progress, better than expected, alongside the value added data can help support a powerful dialogue with inspectors about the impact of the school on students’ achievement. Grade descriptors for Outstanding and Good Achievement have both been changed to include expected progress and exceeding expected progress, in English and Maths with separate judgements being made about progress in reading and writing at the end of Key Stage 2. Good requires figures to be ” close to or above national figures” whereas outstanding states outcomes must be “high compared with national figures”. It’s very important that you have looked at the “Expected Progress” grids in RAISE, for English and Maths, including the ones that show progress at a sub-level. These grids also have data for “Achieving More than Expected Progress”. The analysis table is provided to allow you to make notes and will be useful when coming to an overall judgement for this section. Where you identify outstanding or good achievement a note about why this has happened is useful. Conversely for things you judge as requiring improvement or inadequate but avoid long sets of prose. A simple point, impact and evidence as a series of bullet points is best. There is additional subject specific data in RAISE that you may also want to include in your analysis. Throughout the Handbook for Inspection and Subsidiary Guidance there is continual reference to the progress of various sub-groups. My “good read” rather than a detailed analysis suggests that students entitled to Pupil Premium funding, SEN & disabled students and the more able are the most frequently mentioned groups. It’s worth noting the change from a focus on free school meals (FSM) to Pupil Premium which includes those students entitled to free school meals in the past six years – a much bigger group in many schools. You should also check out the achievement of Children Looked After, those with English as an Additional Language and Service Children particularly if there are a significant number in your school. The subsidiary guidance suggests 20% of a cohort but there is a lot discretion for inspectors around this 20% figure. Again a lot of this data is in RAISE and the performance tables. Inspectors drive hard on this sub-group data so there is no gap or it is rapidly closing celebrate it. If not intervention is needed for the sake of the students, never mind Ofsted. The inspectors will also expect a few case studies on individual students as part of the evidence base so don’t forget to write a few. The Pupil Premium Analyser and Tracker has just been introduced at the school to help us monitor more closely the progress of these students. This is often the forgotten element of the Self Evaluation Form. The data provided and analysed so far is about students who have left the school or moved on to the Sixth Form. What about the progress and learning of the students who are currently being taught? This has become even more important given the January 2014 changes to the School Inspection Handbook. You will need to have attainment data for current cohorts ready at hand for when you get that call. This analysis needs to be on-going, possibly revising this section of the SEF at the mid-point and end of the year. It is very challenging in the middle of an inspection to suddenly pull together and analyse progress data for year groups and sub-groups hence the inclusion in the SEF. There is always a time lag between any actions you have taken to improve things and improved outcomes. They will most likely appear in your internal data first and this is also key to monitoring the effectiveness of any changed that has been introduced. Again there is a big focus on the key indicators used by Ofsted and the issue of measuring progress between Key Stage 2 and 4 is going to be crucial. For the moment, until something better is established, we will stay with levels and look to break down the new national curriculum documents into a series of “level milestones”. It is equally valid for a school to decide to move away from levels but the same issue of measuring progress remains. If any of the elements of your initial analysis leads to you considering that a particular area requires improvement or is just simply inadequate there is a need to analyse it more carefully. Whilst this will be a declining issue in many secondary schools after the November 2013 early entry debacle, what impact has early entry had on results? Look particularly at the progress of the more able, students coming in on a level 5, from Key Stage 2, would be expected to make four or possibly five levels progress to attain an A or A* grade rather than the “expected” three. The progress matrices, for English & Maths, in RAISE are worth careful scrutiny. Are there any particular strengths shown or areas that need significant improvement. For example, three levels progress looks fine but the average point score is low you may look to see what percentage of students are making better than expected progress or if students are not making three levels progress do they make two or much, much less? Is lack of progress in one of the core subjects or key sub-groups having an impact on the data for each indicator that allows you to identify a more precise intervention – more able students’ attainment in Maths, students’ progress who are entitled to pupil premium in English. 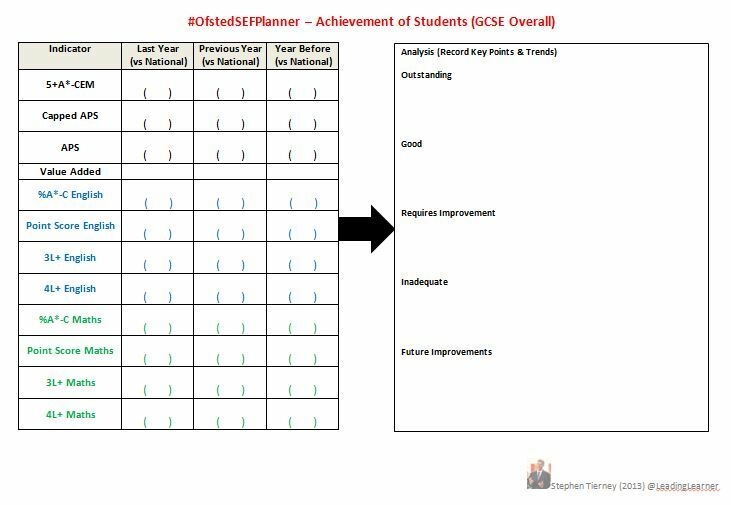 Data is not always good at answering questions but can ask some very interesting questions of the achievement of students within a school. The tables below are taken from the School Inspection Handbook and will hopefully help you make your overall judgement for “Achievement of Pupils”. Terrific post. You might also want to look at the in-school gap between groups, particularly PP/SEN and rest of cohort.